+ How to Price? What is the value of an item ? RULE # 1:As it has been said many times and by many people.....the value of a collectible item is only what the market will bear! That item you so cherish is only of value to someone else who desires it and is willing to pay your price for it. For example, remember the frenzy of Beanie Baby collecting of only a short while back....at it's peak some were going for thousands! Know anyone that still collects Beanie Babies today? Exactly! But maybe that is not such a good example. Let's compare to baseball cards or comic books. Professional skateboarders, for the most part, never had collector "cards" featuring their image in some "in-action" pose. However, skateboarders do have pro models...skateboard decks bearing their name. That's their "card" if you will. Like a baseball player who gets a new card each year, a skater puts out a few new decks with new graphics each year. Like a baseball player that switches teams and gets a new uniform, when a skater gets picked up on a new team, they put out new decks under that company's name. However, here comes the major difference.....skateboard decks are made to be used....to be skated, enjoyed and destroyed....baseball cards are made just for collecting last time I checked. So why is that so important? Well, because these decks get used after they are purchased normally, there are less to be found in mint condition. 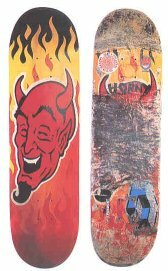 Older mint decks will either come from a warehouse that had overstock, from pro skaters (or their friends) that had some left over, a skateshop that could not sell them, or from people who actually bought them and put them away. Suppose that a company produces 100,000 of Skater-X's deck, and 85,000 get used. That means there are only 15,000 mint decks floating around out there. Over time, that number dimishes too....some decks do eventually get used, some get beat up in moves, and others just get plain lost. So then what are your chances of finding that mint Skater-X deck? When pricing a deck, the first and foremost consideration is rarity.....just how hard is it to find that deck? This is a function of several things. First, how many did the company produce to begin with? During some of skating's slower years (late 80's-early90's for example), companies produced less. Also, smaller companies produce less than the bigger companies. Secondly, how much time has passed? As discussed earlier, as years go by, fewer and fewer decks are around. Following rarity is condition....what kind of shape is the deck in? Mint? Complete? Used? Thrashed? When considering condition, you must always go back to rarity. A deck that has been slightly used will usually take a big hit in price, however, if that deck is very rare....regardless of condition.....it might still be worth lots! Determining rarity comes only through experience. Most collectors focus on a handful of companies or a handful of skaters....either for nostalgia or appreciation of their graphics. Eventually, these collectors come to know what is common and what is rare in their are of interest. This is a skill that takes time to develop. Along with this is the big "unknown". No one knows for sure how many of a given deck exist. Collectors always hear stories of some stockpile of old, long-forgotten mint decks being uncovered in some warehouse somewhere when the people move or rearrange. Along with this, there are several decks in private collections that are not publicized. New collectors usually use eBay as a gauge...."board "abc" is rare because it has only appeared "x" number of times on eBay in the last year"....then they learn to use other sites that sell old school boards to look for prices and availability...from there, they find out about forums and learn from more experienced collectors.....at least that was the natural course of things till our site came along (haha). On this site, we can provide you with many things, but again, determining a decks rarity comes through experience....so we will leave it at that for now. One big lesson here...rarity does not equate to value! A deck might be very rare because few if any still exists. However, if that deck was never that popular and not that sought after now, then it really does not matter how rare it is. Condition is a much easier factor to determine. Either a deck is mint or it isn't. Black and white. It's all asthetic right? Well, close....there is a little bit of "gray area" in there. What determines mint? Also, what are the varying factors of non-mint decks? "Mint" should be easy to define. "Mint" is flawless. "Mint" is lacking any imperfections. However, with skateboard decks, this is not so. The most common definition is "as produced" or "as shipped" with no visible marks, scratches, scuffs, etc., no stickers attached, never griptaped and never mounted. However, there are some factors that collectors vary on...autographs, shrinkwrap, included documents, etc....which will be discussed in more detail below. "Non-Mint" decks can ,of course, be found in varying degrees of use. Some are near mint but have signs of storage marks or "dings". Some have been gripped but never used. Some are set-up as "completes" , have been skated a good bit and then stowed away in some closet or garage for years. Some are so completely skated and used that they they hardly resemble a deck. So how do you price these? For the most part, collectors look at the overall condition of the deck...from the slightly "dinged" to the completely thrashed examples. After that, the key factor is the graphics. What kind of condition are the original graphics in? If someone used rails, the deck might be beat to all hell on the nose and tail, but the graphics could be near flawless. Lastly, there are the completes. They can be real deals to some collectors because they get not only a deck in fair condition, but they also get all the attached hardware....trucks, wheels, etc. Completes are especially great bargains for collectors on tight budgets! Shrinkwrap - You will many times find boards on auction that highlight the fact that the deck is in it's original shrinkwrap. Depending on who you ask, this may or may not matter. Shrinkwrap is just a cheap form of packaging. If a deck is worth more because it is in shrinkwrap, then does that mean that a "mint" deck is really one that includes the original shipping box, bubble wrap and foam "popcorn"? That would be ridiculous. Also, keep in mind that you can take just about anything to your local bulk mailing shop and have it shrinkwrapped...at least in the United States. Could you tell the difference? It's sad to see decks advertised with "original shrinkwrap", and the picture shows the shrinkwrap all torn and frazzled and barely hanging on the deck. At that point, just give it up...tear that stuff off! Some decks, the late 80's Santa Cruz decks for example, were shrinkwrapped because they included marketting material inside...Strange Notes Zine, product catalogs, warranty cards, etc. Those are nice to find in original shrinkwrap because the material is still enclosed, however the effect on value is undetermined. A non-shrinkwrapped Jason Jesse Mary deck will bring just as much in a sale as a shrinkwrapped version! Enclosed Material - As mentioned previously, some companies included marketting material with their decks. This could be anything from a company produced zine to a fullblown product catalog. Most collectors consider those to be "fringe benefits" but not required. After all, it is the deck that is important, not a brochure about the company's latest wheel. A lot of this material is sold now independent of the deck. For example, you will often find old product posters listed on eBay. Color / Colorway - Another sticky point among collectors....color! True some colors are more rare than others. Some stains caught on more than others. Some people just like plain decks...no color at all. Color is by far the trickiest factor in collecting (colorway is similar; simply the combination of many colors). If you see that deck that you have hunted months to find, yet it is not in the color you "prefer", do you let it slip away? Many collectors do. It only makes sense....if you are going to own this thing, spend good money on it, and have it on display, then you really want it to be something you like. Now does color actually affect value? Well, some say it does....usually a seller. They will advertise "I have for sale this *xyz* late 1980's deck in the RARE '*insert color/stain here* color! You might find lots of these, but not in this color! Buy it now!". But it can also have another "true" side to it. If the colors were VERY popular in their day, then that means decks of that color were usually bought to be skated. Hence, there are less in mint condition floating around. Two good examples that come to mind are the red Mullen freestyle decks and the white Kevin Harris freestyle decks (they come to mind because I still hunt for them! haha). Both are very hard to find in mint condition. In those cases, there is some merit to the arguement. Overall, if you had hard figures that said "this company produced 100,000 of this deck and of that, there were 30,000 white, 35,900 black, 20,000 blue, 14,000 red and 100 yellow"....then yeh, those yellow ones would be REAL valuable. It would be hard to place value on "color" without knowing exactly what the production runs were on the colors. Anyone have that info on hand? I did not think so. That should cover most the issues to consider when pricing skateboard decks and related items. We hope it has proven useful. If you have any questions, remember Rule# 1 ! (haha) If you have anything to suggest or add, please feel free to contact us at Art of Skateboarding. Thanks!